Learning how to make hummus is easy, and the result is an appetizer that is less expensive and more delicious than the commercial variety. With one exception, the ingredients are easily found at most supermarkets. Tahini, or sesame butter, can be found at many large supermarkets, especially in areas with Middle Eastern populations. Hummus is a Middle Eastern appetizer made of garbanzo beans (chickpeas), garlic, olive oil, tahini, and lemon juice. It is usually served with warm pita bread wedges. 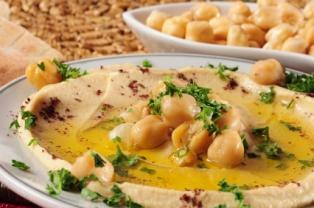 Hummus is found on menus in Armenian, Greek, Israeli, Turkish, Lebanese, Persian and other Middle Eastern restaurants. Hummus can also be found in the delicatessen cases of supermarkets, reflecting its growing popularity. The ingredients are placed in a food processor or electric blender and processed until the end product is smooth and creamy. Chill before serving. Hummus can be kept in the refrigerator for a few days, but should be stirred vigorously before serving to assure that the ingredients are homogenous. Tahini can usually be purchased at supermarkets in larger cities. If it is unavailable locally, it can be purchased at online stores, such as Amazon or The Spice Shop, among others. Some recipes substitute peanut butter for the tahini. This substitution will result in hummus that is sweeter and has a background reminiscent of peanuts rather than sesame seeds. Hummus is usually served as a cold appetizer or first course. However, it may also be served as a major element of a Middle Eastern vegetarian plate, accompanying dolmades (stuffed grape leaves), falafel (fried chickpea balls), spanakopita (spinach pie), or other dishes. In some parts of the country, it turns up frequently as a party dip for chips or raw vegetables. Hummus is a high protein snack or appetizer. It also contains olive oil, which is a desirable fat. While some snacks provide empty calories, hummus adds to daily nutrition. If fresh, raw vegetables or wholegrain pita bread is served with the hummus, the nutrition value of the snack is further improved. If the total calorie count is an issue, avoid fried chips. Depending on the recipe, two tablespoons of hummus provide approximately 50 to 100 calories. Serve tasty, garlicky hummus as an appetizer, party dip or a snack. Hummus is a healthy treat that can be enjoyed by vegans, vegetarians, and omnivores of all ages. For some, it may take a few tries to appreciate both the flavor and texture of hummus, but everyone is sure to agree on its nutritional value.